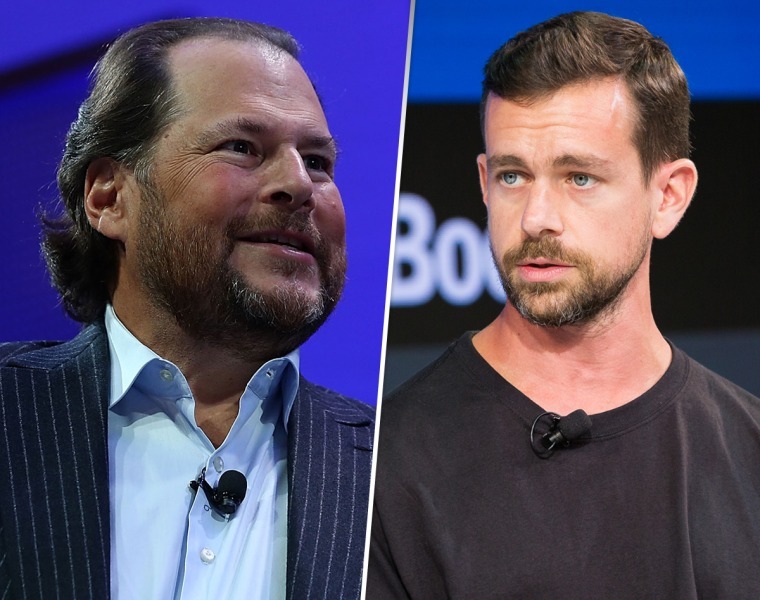 'Homelessness is all of our responsibility,' Salesforce chief Marc Benioff tweeted to Twitter co-founder Jack Dorsey. Two of the biggest titans in the tech world feuded on social media Friday over the best way to help the homeless, an increasing population in large cities across America. Salesforce founder Marc Benioff tweeted his support for a November ballot initiative, Proposition C, that would tax San Francisco's largest businesses to raise as much as $300 million a year to support programs for the homeless. "Homelessness is all of our responsibility ... ," Benioff tweeted. Twitter CEO Jack Dorsey responded that he's on the same page, but Proposition C isn't the best way to address the problem. He said he put his faith in Mayor London Breed, who was elected to tackle homelessness. "I want to help fix the homeless problem in SF and California," he tweeted. "I don’t believe this (Prop C) is the best way to do it." That's where things got salty. Benioff, who on Monday pledged $2 million in campaign funds for the initiative, asked Dorsey what he's contributed to efforts to alleviate homelessness, including the $37 million Hamilton Families Heading Home Campaign in San Francisco, which Benioff helped start two years ago. "Which homeless programs in our city are you supporting?" the Salesforce chief tweeted. Dorsey, who's also a billionaire on paper, deflected, saying Benioff was "distracting" from the point of his original response. The upshot is that both men say they're friends who saw each other at a basketball game recently. Proposition C would tax big companies in San Francisco, like Twitter and Salesforce, to help provide shelter for the estimated 7,500 homeless people in the city. Benioff says the measure would provide housing for 5,000. "Marc and I talked on the phone," Dorsey tweeted after Friday's exchange. " Also talked with Mayor London this afternoon. We’re all talking now and aligned to fix this issue as fast as we can. Will keep everyone updated."